The first part of this page is for you to read. Make sure you understand it though because you will do something with it at the bottom. The dot tells the browser to look in the current location (the current folder/directory). The browser would look for that page in the folder which contains the linksite folder (in the above example there wasn't one). The dot says to start in the current folder. Inside that the browser looks for a folder called oranges and the page should be in there. Most people will sort of understand that and then immediately forget it. To avoid that create the folder structure in the above example inside the intermediatesites folder. 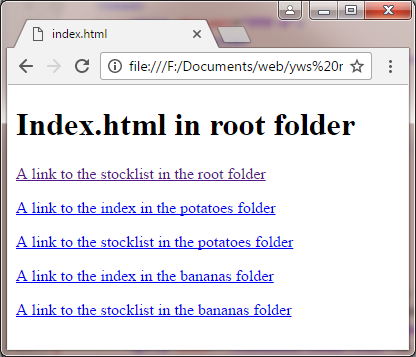 Then create the six HTML pages using your template (they can be blank apart from a short sentence describing what they are maybe like this: stocklist.html inside bananas or index.html in the linksite folder etc.). The last one is a combination of what is explained above. Test them all.